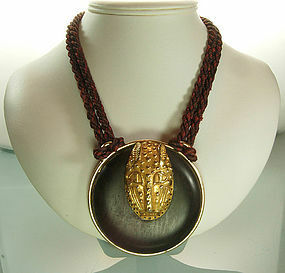 Very dramatic 1980s goldtone metal mounted wood necklace with a large detailed dimensional head of a leopard, hanging from a heavy double strand of dark red silk cord. Marked DOMINIQUE AURIENTIS PARIS. The leopard head element is based on 16th century Benin bronze leopard head masks which were worn as waist or hip ornaments. The leopard was a symbol of royal power in Benin and was also depicted in statues, full size masks, and other objects. Great size -- the pendant is 3 1/8 inches in diameter, the leopard head is 2 1/8 inches long and the cords are 38 inches long (wearable length). The cords can be knotted to shorten the necklace, or they are long enough to double. Excellent condition. Photos enlarged to show detail. Display forms are life-size.